Forget the fake Rolex watches sold on street corners. These days, most counterfeits are sold over the Internet, right into your home. And some of them could seriously hurt you. Take bicycle helmets. If you don't use one, you probably have a child or relative who does. Bike helmets are meant to protect us if we ever have a serious fall. But counterfeits won't provide that protection. At Specialized Bicycles, they've seen the evidence. The headquarters is in Morgan Hill, Calif. — about 30 miles south of Silicon Valley. That's where Clint Mattacola spends all day testing the company's bike helmets to make sure they exceed federal safety standards. He sees fake helmets all the time. For instance, he points to two black helmets. 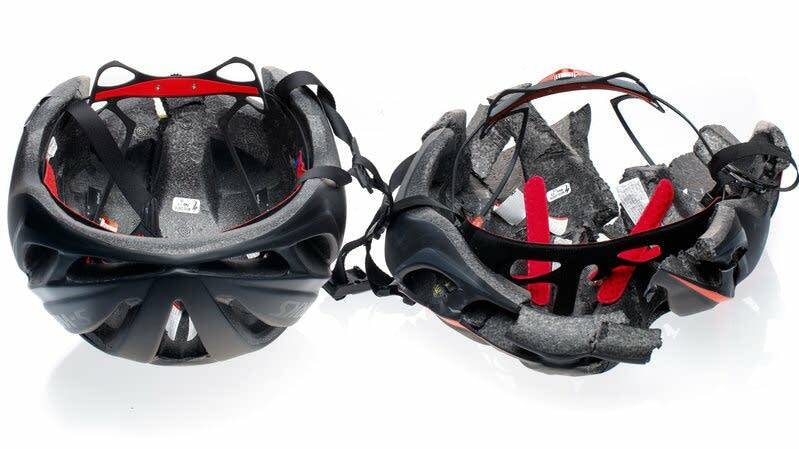 One is an authentic Specialized Evade II, and the other is a counterfeit helmet. "They look very, very similar," Mattacola says. On the outside, they're identical. But inside, they are very different. Mattacola proves it by running both helmets through the safety tests in his lab. He straps a helmet to a dummy's head and tests to see if it can be pulled off; if the straps stay in place; if it will protect against a crash. Mattacola picks up the two pieces of the fake helmet that has broken in half. If a cyclist had fallen the same way wearing that same counterfeit helmet, Mattacola says, "their skull would have hit the surface. Most likely would have suffered from skull fracture, brain damage or death." The company says the fakes often have logos relating to European standards, but they do not carry the interior stickers that indicate the helmets meet U.S. Consumer Product Safety Commission standards. Mattacola was contacted by a rider who complained that his helmet didn't fit properly. So Mattacola responded, "'Well, where did you buy it?' He said, 'I bought it on eBay.' I immediately said, 'Well, it's a counterfeit.' I didn't even have to see the helmet. He says, 'Well how do you know?' I go, 'What does the sizing say on it?' He says, 'it says: Asia Sizing.' And I said, 'It's a counterfeit. You bought it on eBay. It's an Asian Fit sizing. It's a counterfeit.' "
Some consumer advice extends beyond just fake helmets. William Ross is the deputy assistant director for the Homeland Security Investigations-led National Intellectual Property Rights Coordination Center, which brings together 23 partner agencies to fight all kinds of counterfeits. The fakes can range from knock-off air bags for cars to fake components used by the Department of Defense. "It used to be that most of the drugs you would see online are what we would call the 'lifestyle drugs.' We're now seeing cancer medications, heart medications, true lifesaving medications which are being counterfeited and sold online," Ross says. Nationally, Customs now confiscates almost twice as many counterfeits as it did 10 years ago. Ross says that because of e-commerce, "we're seeing a lot of smaller packages come in." In 2017, 90 percent of the counterfeits seized by the feds came through express shipments or the international mail. "I would say to the consumer, beware of what you are buying and where you are buying it from," Ross says. "Buy from legitimate outlets, whether it's in-person or online. What you're buying online could be counterfeit and could potentially hurt or kill you." Companies like Specialized are fighting back. Andrew Love leads a team of 14 at Specialized who monitor 85 e-commerce websites around the world. Hunched over his laptop computer, Love says, "right now, in the helmet category on eBay — selling directly from China to the United States — 34,582 listings." Love says e-commerce sites will remove counterfeits once they've been identified. The Chinese e-commerce giant Alibaba has developed technology to weed out the fakes even before they are flagged by the targeted companies. Spokesperson Brion Tingler says the company's technology "proactively monitors the Alibaba platforms, which have over a billion listings at any one point in time. And it's constantly scouring for things that would potentially be fake goods. We're proactively removing 27 times more listings than we have reported to us by rights holders." Some merchants will just turn around, open new accounts and start selling counterfeits again. For repeat offenders, Andrew Love at Specialized goes after their money in court. "We've seized millions of dollars doing that. It's been very effective. And I get hate mail every now and then in Chinese." Sometimes Specialized works with its business partners overseas, including Alibaba. "With the bicycle helmet, for example," Tingler says. "It's being created in a real factory by real people. To stop that, the best way to do that is to go after the source. Which is the factory that it's being produced in." Last year, the companies went after counterfeit manufacturers in China. Specialized worked with Alibaba and Chinese police to close down four factories.